15 Things Top Sales Managers Do and You Should, Too!! What makes someone a great sales manager? What separates them from the rest? 1. Realize their job is not to be a sales manager, but to be a sales leader. 2. Hold constructive sales meetings salespeople find value in, rather than meetings that are nothing more than information updates. 3. Spend time with their top performers. 4. Leverage their position as a sales manager to generate opportunities and discussions with customers while working with their salespeople. 5. Don’t let their own paperwork stand in the way of spending quality time with their people. 6. Coach their people each day and hold them accountable on the skills they’re developing. 7. Provide an environment that allows their salespeople to be motivated every day. 8. Never talk negatively about any of their people or anyone else while in the company of anyone. 9. Help each of their salespeople achieve their professional and personal goals. 10. Be open and accountable to others. 11. Realize their objective is not only to make the numbers, but also to develop their people. 12. Impact everyone with whom they come in contact in a positive manner, regardless of who they are or the position they hold. 13. Know their role is to lead their people and allow their people to lead their customers. 14. Demonstrate 100% respect to everyone. 15. Hold as a personal goal developing a team that everyone wants to be a part of, and be the manager who assures a majority (if not all) of the people on the team are recognized and promoted for their performance. As you can see, these attributes are not out of reach of most sales managers – if they are willing to put effort into becoming a leader! Do you want a free infographic I put together on sales leadership? 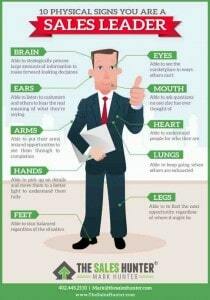 Check out 10 Physical Signs You Are A Sales Leader. PrevPreviousYour Customers Aren’t Cheap. Your Salespeople Are. Its really very useful for sales manager, sales leader .